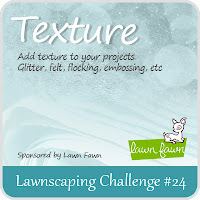 There's a brand new Lawnscaping Challenge #24 being showcased today over on the Lawnscaping blog. The theme for this one is TEXTURE! For my card, I chose to add texture by using the snowflakes embossing folder in the back of the pine tree. Dry embossing is definitley one of my fav ways to add texture and details to any project. I also used a Snow Marker too, in order to give the impression of snow on the tips of the tree. Visit the DeNami Design blog today for details on the very Last Product Spotlight of the year. This time, we are featuring the fun "Upright Thank You" image from the last release. I sure hope you all get a chance to visit the DeNami blog today in order to view more beautiful creations using this great stamp! Welcome to another fun monthly Blog Hop from DeNami Design! This month's theme is pretty unique from any in the past. The theme is: Gift Wrapping!!! :) How fun is that?!.... 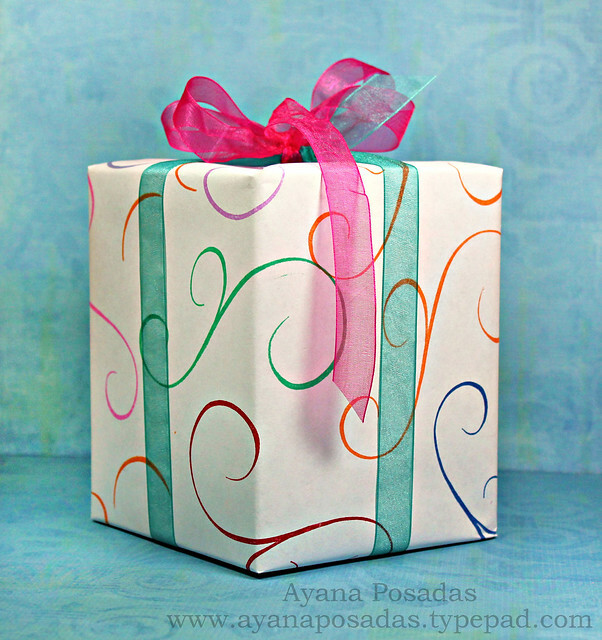 I made my own wrapping paper with the pretty Swirl image. I simply stamped in multiple times with various bright colors, and then just added some sheer ribbon. Super easy, quick, and pretty!!! I love the whimsical design of the swirls. I hope you do too! If you've been following along since the beginning of the hop, then you should be coming here from the fabulous blog of Kristy Smith. Hope you enjoyed her CUTE creation! My blog is actually last on the list today, so I sure hope you all thoroughly enjoyed all of the fantastic gift wrapping projects along the way. I also hope you left lots of comments too, because that will help you get your chance at winning some DeNami gift certificates! If you'd like to start at the beginning of the hop, just head on over to the DeNami blog for a full list of participants. Hey there (again).... I'm back with my second post for the day. 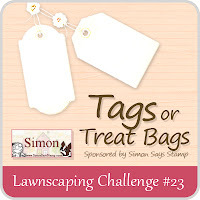 This time I'm featuring the latest Lawnscaping Challenge #23- Tags or Treat Bags. You have the option of creating a tag(s) or a treat bag for any type of occasion. 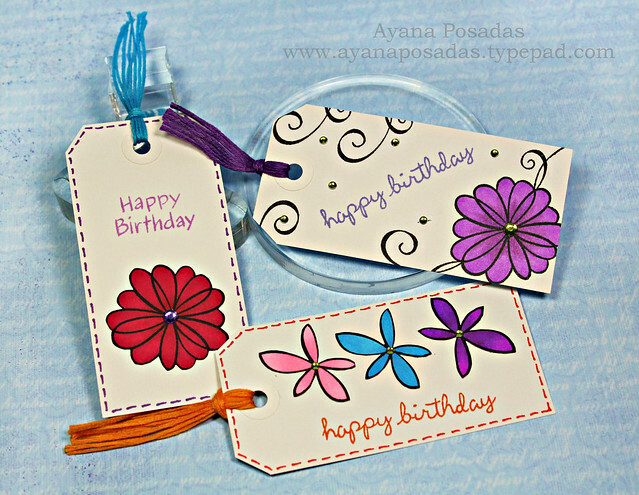 For my entry, I chose to make up these fun Birthday theme tags that you could attach to a gift for someone. Hope you guys enjoy them and hopefully you'll get a chance to play along in this challenge as well. Just visit the Lawnscaping Blog for all of the full details and also to view more samples from the rest of the design tem girlis. DeNami Theme Challenge #8- CHRISTMAS! With the start of December already here... (where on earth does the time go?!)... we've got a brand new Theme Challenge over on the DeNami blog. This month's theme is CHRISTMAS!!!... Just perfect for the upcoming holidays.